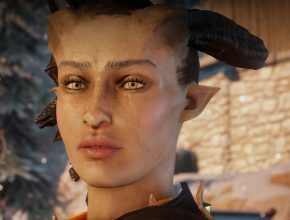 … due to “I want to finally play the Blackwall Romance” and “uh, a Qunari romance with Iron Bull”, I now finally finished the Jaws of Hakkon. And what can I say? I loved it. I liked it much more than Descent, to be honest. The things that stayed in my mind from Descent was that it was really pretty in parts and how I was disappointed by how unimaginative the Titan’s heart at the end was. I know the lore in Descent is incredible but somehow, Jaws of Hakkon got to me more, emotionally. The story of Ameridan and Telana and their companions, the way the Avaar are presented, the whole region… it’s wonderful. It drew me absolutely in, I loved the warmth of the light and the Frostback basin in general, the little bits of history scattered around. It was all in all a just such a beautiful DLC. Of course there are always some things that are somewhat annoying. The breadcrumb trail of trail markers was a bit… I don’t know, with quests like these I always wonder how nobody else ever managed to do that. In 800 years, mind you. But well, that’s just the things that happen in video games, I guess, and in the end I didn’t mind them much. Combat was somewhat strange. I expected more cold immune enemies and thus had equipped everyone with superb fire runes, but apart from the big boss fights, there was not much need for that. There was only one fight that completely overwhelmed me (in such a way that I changed the difficulty back from Hard to Casual after several tries because I got tired of it) and that was on the island where one finds the remains of Telana and talks to the spirit. The combination of mages and archers that managed to cut through Guard and the whole Lifebar with one shot(!) was something I didn’t manage to match for some reason. But everything afterwards didn’t really bother me. Once I managed to come up to the Old Temple, I had to disable most hair / appearance meshes and mods. Until that point everything worked just fine but the Old Temple had some issue or other and froze in the loading screen. I suspect either the Blackwall or Sera appearance mesh, even though neither was in my party. 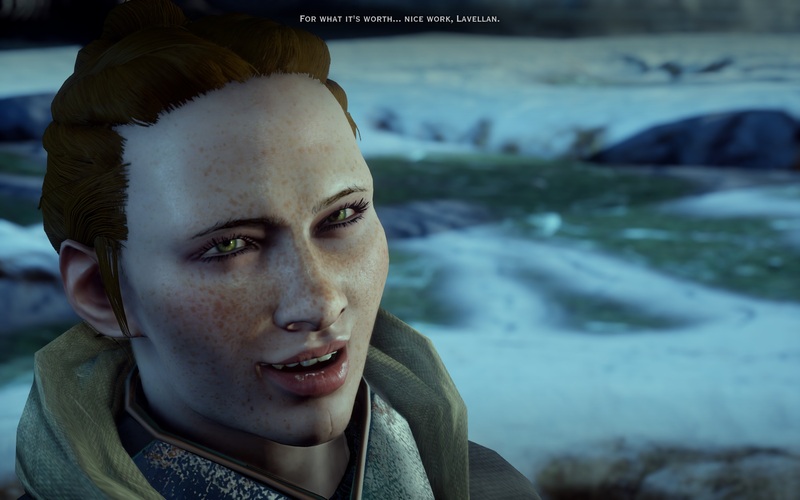 But apart from that, I had no issues – and thankfully, the mod I used for Lyssa’s appearance worked as well. Which was fortunate because I know it would’ve been cross had I not been able to play the part in the Old Temple with the way Lyssa normally looks. It would have kicked me out completely and that would’ve been a shame, especially since the conversation with Ameridan moved me to tears. The tidbits one found up to the point had already painted a wonderful picture of him and meeting him… ah. The way he welcomed you, understood you, thanked you… it was really moving. 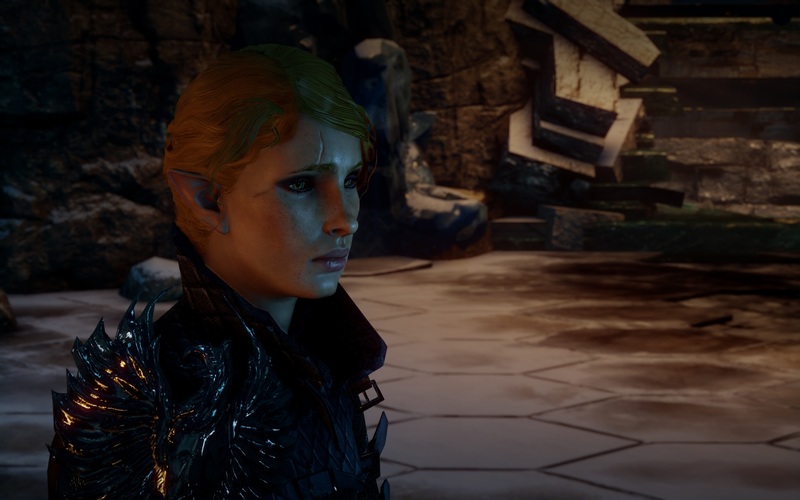 It might be something that is special to my headcanon or to playing as Lavellan here, though. 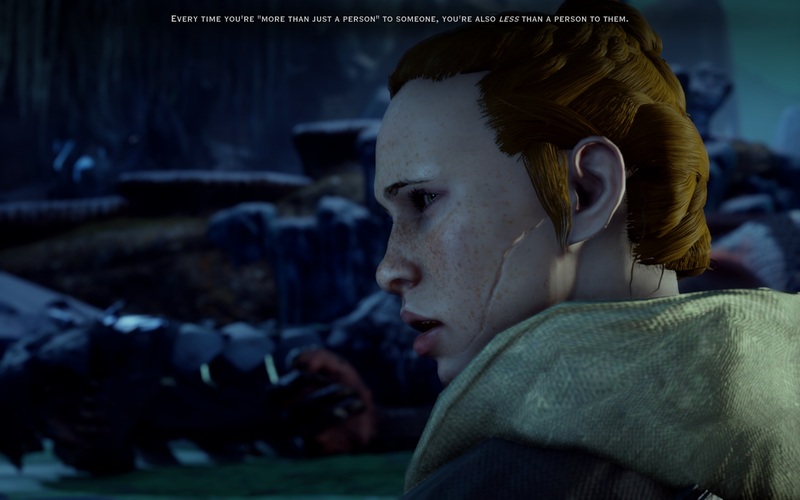 Not only did he greet Lyssa as fellow elf AND Inquisitor, the things they (if only shortly) talked about concerning the relationship between elves and humans was heartbreaking. Just think about it: we know that Solas is old, very old, back from the days of Arlathan, when the elves were at the height of their might. Ameridan is 800 years old – from a time before the Dales were destroyed and the humans enslaved the elves. So he sort of bridges the span between Solas and Lavellan. Oh, the “what ifs” that come from that alone… Ameridan was a close friend of the first Orlesian emperor and the mission he was sent on was supposed to be a short one. 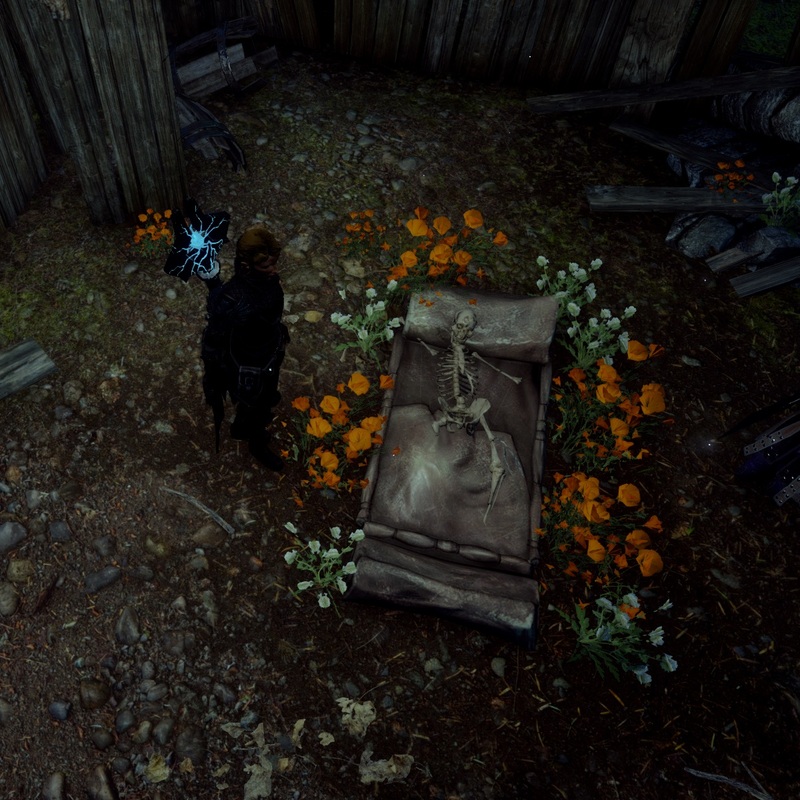 After which he intended to go back and convince the Dalish to fight at the humans’s side against the Blight. The whole history of the elves and Thedas itself could’ve changed if he had succeeded. Excuse me while I cry a bit. There were several points in the DLC were I was close to tears. The conversation with Ameridan among it, then the memories that you can collect afterwards, the talk with the spirit who watched over Telana… It got to me. Also there is a conversation with Scout Harding (WHO I COULDN’T LOVE MORE IF I TRIED) at the end about not being seen as more than a person and at the same time not as a person at all, mirroring this bit of story I once wrote. It is the first time she calls the Inquisitor by name instead of “Your Worship”. Sorry. Gonna cry some more. Oh and did I mention there was a comment about Lavellan being obsessed with elfroot also completely matches my headcanon? But there was also a lot of fun to have. The un”bear”able quests with Stovacker – who could resist making those jokes if only to annoy Cassandra? I certainly couldn’t *giggles*. Next up: quickly killing Corypheus, again, and then on to Trespasser. I agree on basically everything! It also had quite a few hilarious moments. And I am so happy about how they portrayed the Avvar and their use of magic and interaction with spirits. Bc yes of course we’ve already had a very different than chantry teachings perspective with the Dalish but given how subjugated the elves got by humans I found it incredibly to see even another culture, one arguably not as removed as the Dalish from human traditions also not adhering to the fear mongering of the chantry and being absolutely successful with that. It strengthens the Dalish perspective by proxy imo. 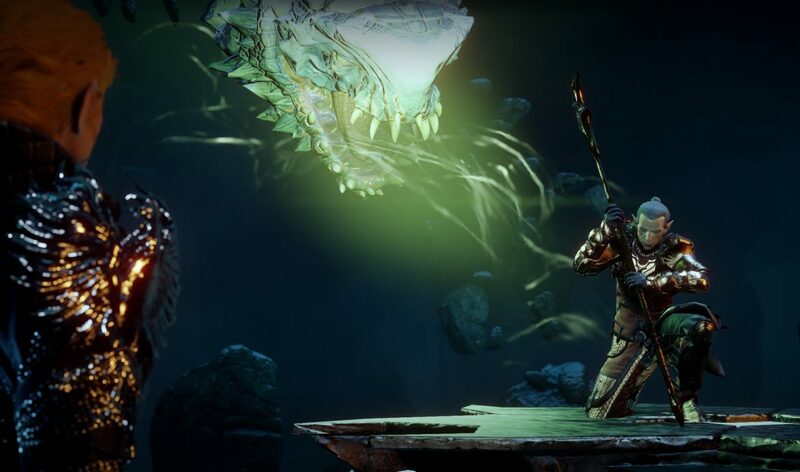 Additionally for me it was also at the same time much closer to any sort of spirituality I find relatable than both the human chantry lore and the Dalish pantheon was. So yay for more variety there. And yes that conversation with Scout Harding was sooo good and emotional. That is also a very impactful moment for Amara because she spent so much time thinking about and deliberately cultivating the distance between her and everyone around her that she is so incredibly used to people not really seeing “her” at all. Meeting Ameridan also is almost a life changing thing for her. No so much because he is a bridge to lost culture but more because of what he did and how he ended up. It makes her realise that it is all nice and well to plan things for the future, having big goals of what you want to achieve and how your life might look. like one day – but it doesn’t matter at all in the end how you envisioned it if you don’t DO. It changes her whole way of thinking (what she could do with the Inquisition later to help people, what they could work towards) from a “well, one day we can perhaps” state of mind to a “I am going to do things, NOW!” position. 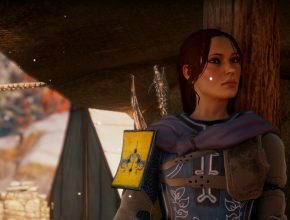 Which is ultimately the stepping stone for her being fully on board with dissolving the Inquisition after it becomes slow to act and trapped in procedure in Trespasser and to decide to find a way to do more things that immediately help people with Sera & Bull later on. It was a great DLC! I think it got a bit overly judged because it is not very story dense in terms of cut scenes and a narrative being pushed. But it is just overall so well designed – the entire region is filled with things to discover that paint a bigger picture piece by piece. Like, the entire map is waaaay better designed than 80% of the main game maps that tried to do the same thing but didn’t succeed at it this well. Basically this is a bit like the DA2 DLCs for me: It shows how exponentially better the game could have been if they would have had the same resources and the same amount of careful thought and planning for every main game region. Questing through the other maps could have been THIS engaging. YES!! This, absolutely, all of it!. For Lyssa meeting Ameridan was such a moment of… connect. She felt like he knew exactly how she felt and what he says about enjoying the things you have in that exact moment, because the rest will be taken away by the world, resonated so deeply. Also this whole story of importance that in the end… changed so little and left him isolated and alone for such a long time. Ameridan being a bridge to a lost culture is not that important, also because it barely came up. But his ability to be a bridge between Dalish and humans does impact her – beautifully shown in the prayer to both Ghilan’nain and Andraste. 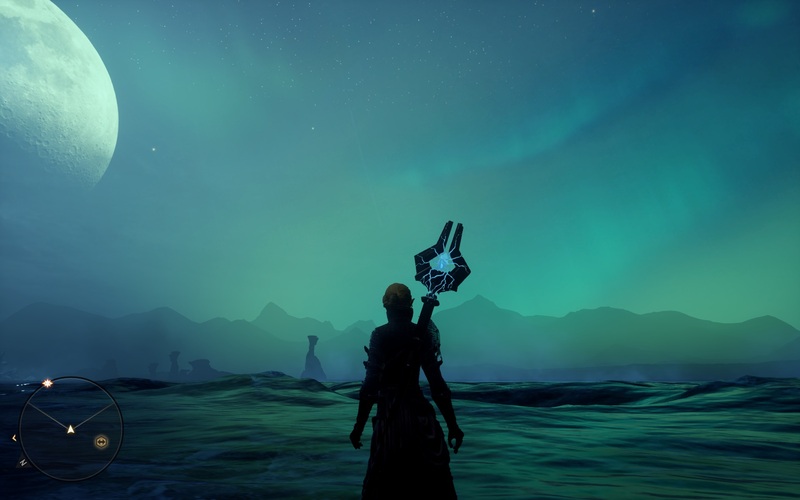 The whole DLC was nearly on par for me with Trespasser in terms of personal and emotional (potential) involvement, because it mirrored so many things that we as Inquisitor experience.